#stampinup #faithfulinkspirations Oh my goodness! I just realized this is my 1000th blog post! Woot! Let's keep going to 2000, shall we? If you've been following my blog posts, you know that I've been gushing over the True Gentleman Suite in the Occasions catalog. I just love everything about it! It's tailored and it's whimsical and I think that's a perfect combination. Look at this adorable card! I CASEd this card from one I saw on the display board at Stampin' Up's OnStage event. (CASE=copy and share everything) It was so perfect! And so easy to recreate. I added a 5-1/4" by 4" piece of True Gentleman Designer Series Paper to a Crumb Cake Card Stock card base. Then I cut a 4-1/2" by 2" strip of another sheet of this DSP and flagged the end with the Banner Triple Punch. I added a looped length of Lemon Lime Twist 3/8" Mini Striped Ribbon to the banner and then wrapped everything with a length of Linen Thread before adhering the banner to the card. Next, I stamped one of the hexagon sentiments from the "Truly Tailored" stamp set in Night of Navy Ink onto a Very Vanilla scrap and punched it out with the Tailored Tag Punch. I stamped the sentiment again in Crumb Cake Ink onto Very Vanilla and fussy cut the fox. 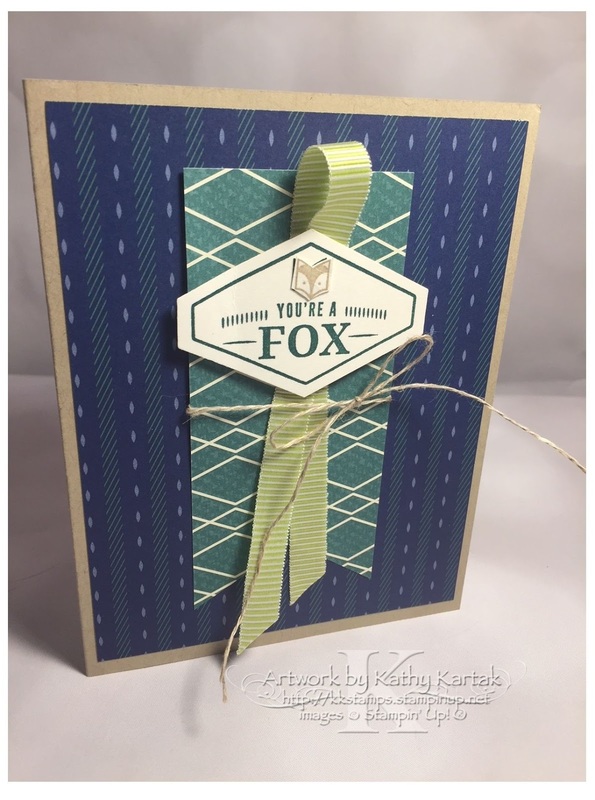 I adhered the fox to the tag with a Glue Dot and then adhered the tag to the card with Stampin' Dimensionals. So stinkin' cute, right? !